One thing that you can more readily see in hindsight is what I’ve been examining most consistently through the course of this series of posts is the shape of a franchise. 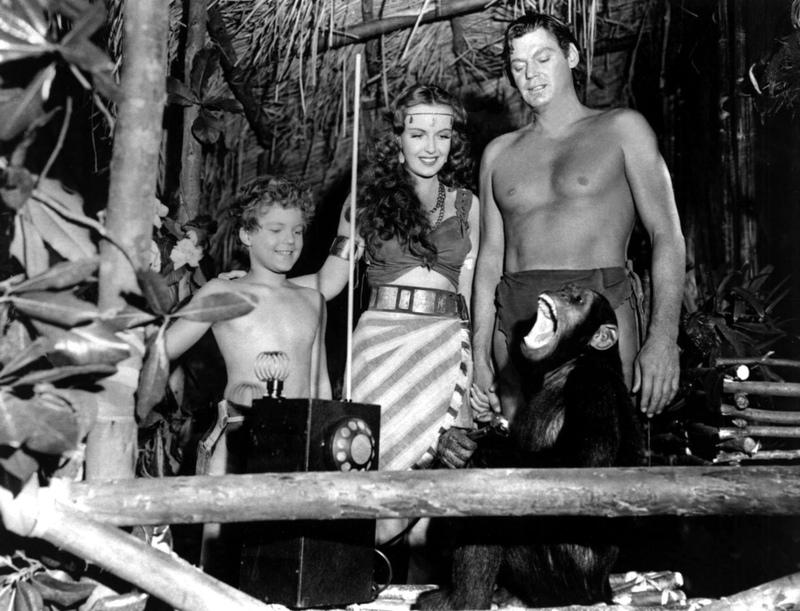 With Tarzan’s Secret Treasure what RKO seemed to be trying to do was as closely emulate the MGM Tarzan films as they could. What occurred in Tarzan Triumphs is that they were much closer to making it an RKO film. Now, it has been widely reported and agreed upon that RKO, unlike, say MGM and Warners, did not have a signature style in the studio era; so I suppose what I really mean is that they came closer to making it a well-crafted B-Film that had as much if not more fun than MGM packed in and less shimmer. One shrewd move that RKO made when assuming the mantle of the series was to put off re-introducing a re-cast Jane. Ultimately the new actress playing Jane was put behind the eight ball by the parts written for her. The fact that she was not Maureen O’Hara, or even a reasonable facsimile, also hurt greatly. So the transition to a more RKO-friendly formulation was as of yet imperfect and would be bettered for the next installment. The quickening pace of production also became even more apparent here as this is one of two releases from 1943. Weissmuller assumed the role from 1932 to 1948 and this was the only year in the whole run when there were two releases in a calendar year. So, yes, this is the (in)famous installment when Tarzan does do battle with the Nazis. As silly as that can be, as inconsistent as the German and/or English accents, as vaguely as said Nazis are clad; those aren’t the biggest issues. Some of the biggest troubles are the same as they ever are. 10 minutes in, and what has actually happened? They met a new character but no inciting incident really occurs. An “Iron Bird” makes its ominous appearance but they everything is OK for another minute or two. Yet, through that consistency there are some odd changes. Namely the instances in the two-film absence of Jane there are some awkward, uncomfortable sequences where Tarzan must ally himself with a woman from another tribe, which is handled fairly platonically, until for reasons unknown, Boy prods Tarzan to swim or engage in other activity that’s fairly flirtatious, especially during the Code. This being the same Boy who’s been raised believing Jane has been his mother. It’s quite odd to say the least. The film ultimately falls into a sequel trap wherein the writing seems to try to shoehorn in things the audiences like and expect. What do we do now? What do they want it, and how do we give them more of it? While it is good that here Tarzan does start to have friendly interactions with other tribes, and is not always keeping “unruly savages” in check. An odd habit does develop of casting other caucasian actors, not making any attempt to disguise their ethnicity in make-up and simultaneously giving them no backstory, or even making comment as to why they’re in the jungle. Particularly when Tarzan battles Nazis this is a missed opportunity and more than a bit unfortunate. It’s hard to believe that the next film would be RKO’s zenith but sure enough it was, even after all this.